With the recent scare of Dog Treat Recalls, I am being so diligent on searching labels for the Made in USA label. You would not feed your children or family members food that was not safe, it is just as important to find safe dog treats that wont make them sick. I am somewhat nervous because I did recently review Kingdom pet Dog Chews and was assured by the PR contact that they were safe. I have now learned my lesson, just stay with treats made in the US or make your own dog treats. 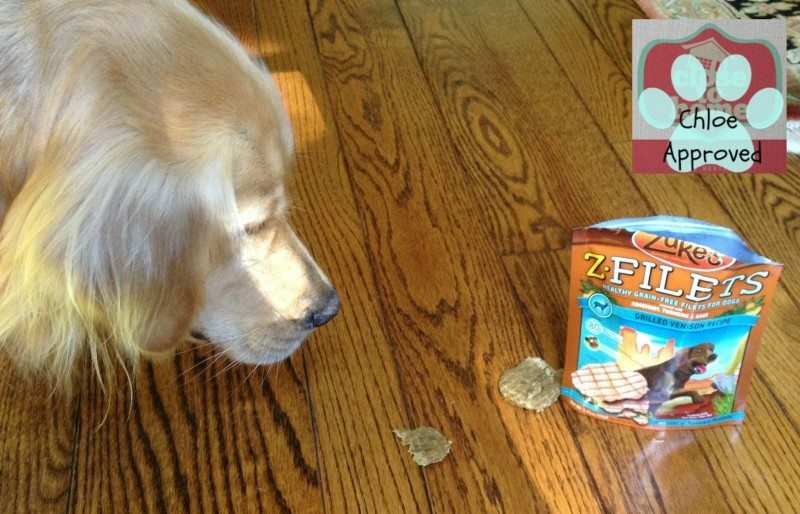 I am so thrilled to be sharing one of my dog’s favorite safe dog treats made in the USA from Zukes Pets. On their website today, it is announcing that Zukes Treats have never been recalled. This is so important when dealing with your dog. You would do the same for your family. They also make all natural Cat treats too, we don’t want to forget about our feline friends. 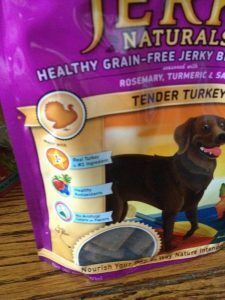 While all natural dog treats may be a little more expensive, it is well worth the price considering it is your dog’s health and in some cases their lives. 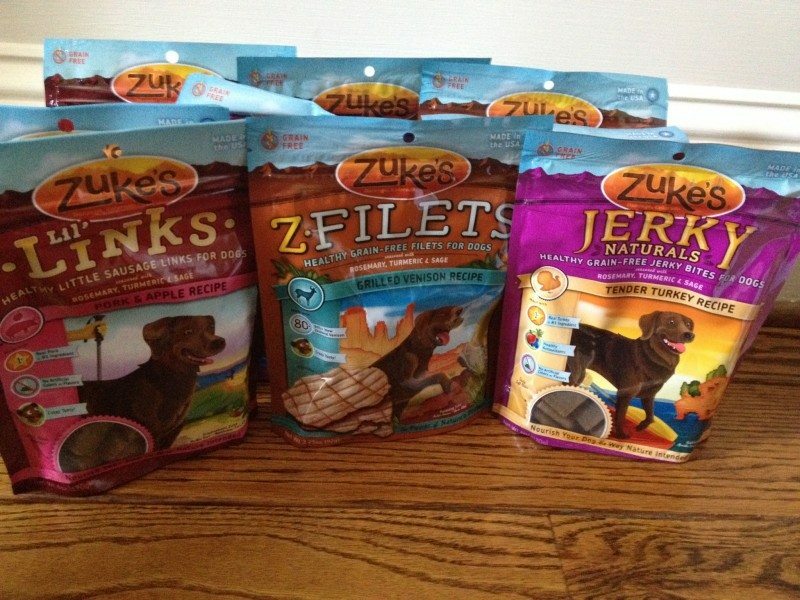 Zukes Dog treats come in a variety of flavors and textures you are sure to find several that your dog will love. Can you see the drool on Chloe’s mouth? Contamination that caused this latest recall would not happen at Zuke’s. We test for pathogenic bacteria throughout the entire manufacturing process including the finished treats, before they ever leave the manufacturing facility. In addition, all our raw ingredients are tested when we receive them from our suppliers, before going into the manufacturing process. The tests vary depending upon the ingredient. Grains are tested for Aflatoxins and frozen meat ingredients are tested for Salmonella, E. coli and other pathogenic bacteria. Zuke’s treats are made in certified facilities that are inspected by the FDA. And we demand the highest quality ingredients from each of our suppliers so we can ensure our products meet stringent US quality standards. The suppliers in our manufacturing process have been providing quality ingredients to Zuke’s for a very long time. I look that they aren’t made in China. Other than that, variety and price can come into play since treats only supplement their diet. I look to see that they are made in the US! I look for natural ingredients and if they are make in the USA. I look for a trustworthy company that discloses the source of their ingredients, high quality ingredients, and of course a treat that my dog loves. We are huge Zuke’s fans! I look for one that she’ll eat. Plain and simple. I have a picky dog. I look for treats with good and natural ingredients. I look for something that has healthy ingredients with mostly meat, and something that is soft or crunchy but easy to chew. Vix is 11.5 yrs old and has some tooth problems so anything too hard doesn’t work well for her. She does like several of the Zukes products though especially the minis. Thanks for the giveaway. I try to look for treats that are moderately priced and don’t have a lot of crazy ingredients that I can’t pronounce. Thank you. I emailed the company they sent me samples and my dog loved the rabbit and apples!! Yummy flavors that they care about, and healthy ingredients or at least dental benefits or something like that are a couple of things I care about. Made in the USA is important, with high quality, safe ingredients. Beyond that, I look for a palatable (moist, “tasty”) treat that’s small and easily broken into even smaller pieces with little mess- that way I can give treats often during training without overfeeding. I like seeing extra positives too- good for hips/joints, teeth, etc. I also factor in cost. We pick a name brand that looks good. When choosing dog treats I always look to see if they were made in the USA. I also check the ingredient list. they are made in USA.. I look for food that she will like and natural ingredients cause she gets flakey skin. Anything healthy and nutritious, that’s also palpable.. My dogs are picky guys!! I look for quality ingredients that my dog will love. these days I look for treats made in the US. I look for ingredients that I know my dog likes. I look to see that they are made in the US and that the first ingredient is meat!